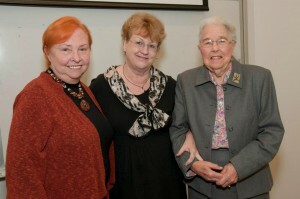 Barbara Atkinson, M.D., (left) joins Lynda Payne, Ph.D., Sirridge Missouri Endowed Professor in Medical Humanities and Bioethics, and former School of Medicine Dean Marjorie S. Sirridge, M.D., (right) after presenting the 2012 Marjorie S. Sirridge, M.D., Outstanding Women in Medicine Lectureship on Sept. 27 at the SOM. Barbara Atkinson, M.D., encouraged young faculty members to further their careers and find leadership opportunities with insights from her personal and professional experiences in her lecture titled, “Evolution of a Career in Leadership: a Personal Story,” during the 2012 Marjorie S. Sirridge, M.D., Outstanding Women in Medicine Lectureship on Sept. 27. Atkinson is the former executive vice chancellor and executive dean of the Kansas University Medical Center and former chair of pathology at the University of Kansas School of Medicine. She talked about how she sought out leadership positions and formal and informal training, people who have inspired her, and challenges along the way. Atkinson graduated Jefferson Medical College – the last medical school in the country to accept women – in 1974 and entered the field of pathology as a professor, researcher and administrator at the University of Pennsylvania. From 1978 until 1987, she was director of the Cytopathology Laboratory at the Hospital of the University of Pennsylvania and was chair of the Department of Pathology and Laboratory Medicine from 1987 to 1994 before moving to Hahnemann University. In 1996, she became Annenberg Dean of the MCP Hahnemann University. At the time, there was only one other woman dean in the country. She was also the first woman and first cytopathologist to be elected as a trustee for the American Board of Pathology, for which she is a past president. Atkinson left Pennsylvania in 2000 to join the University of Kansas School of Medicine Department of Pathology and Laboratory Medicine. She continued to climb the ranks. In 2002, she became executive dean and vice chancellor for clinical affairs and in 2005, she became the School’s first female executive vice chancellor. In 2010, President Barack Obama appointed Atkinson to the Presidential Commission for the Study of Bioethical Issues. During the conclusion of her talk she pointed out personal characteristics that have aided in her success such as being a good listener, risk taker, good communicator and delegator, and having a strong moral compass. Atkinson also mentioned tips to help further one’s career in medical leadership, such as boosting a national reputation, having a strong team, clear and measurable goals, and celebrating each step of an accomplishment. Throughout the years, Atkinson has received multiple awards for her outstanding work in the medical community, has published and edited several books and articles and been a member of multiple professional organizations.